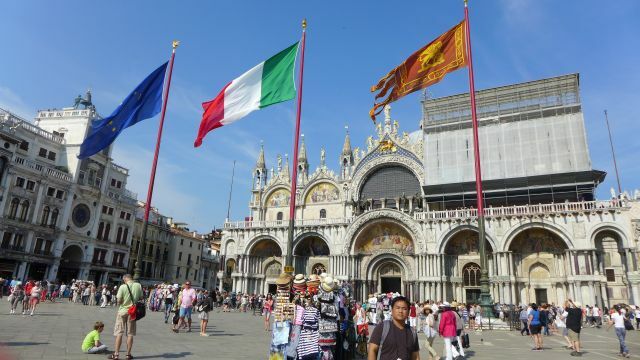 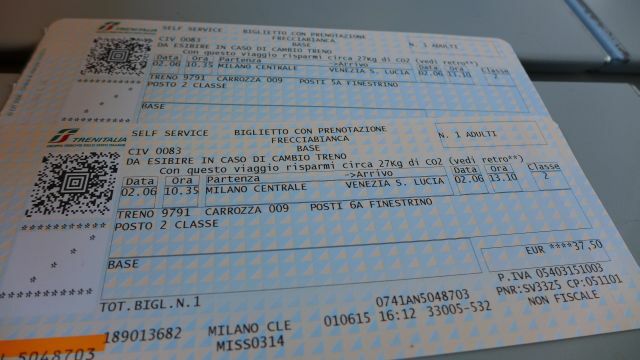 Today we would be heading to Venice from Milan. 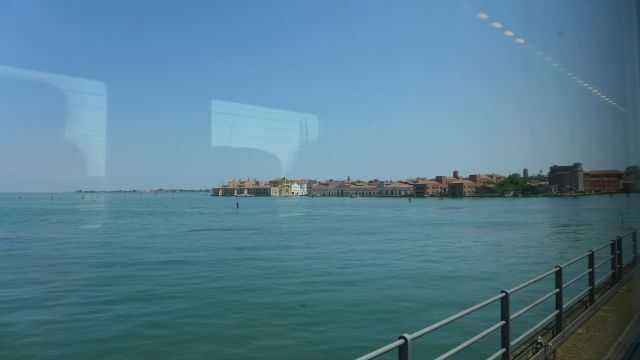 Our train to Venice today would be departing at 10.35 am and it would take about 2.5 hours to reach the Venezia Santa Lucia train station. 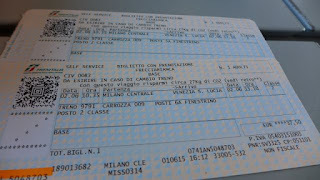 Our train ticket cost EUR 37.50 which we bought at Milano centrale ticket machine. You could get a promo ticket if you purchase it much earlier which can be done online. 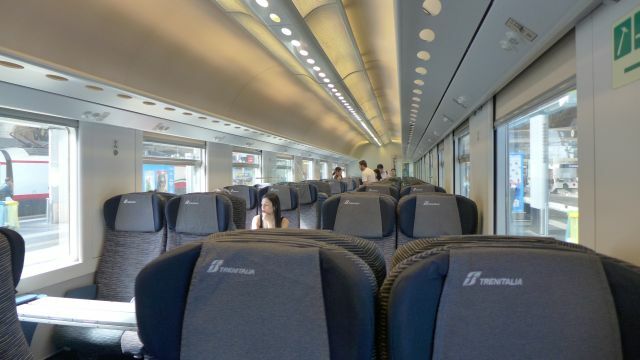 Our ticket had a designated coach and seat. 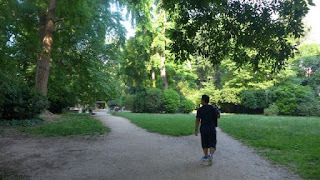 Unfortunately that day, our coach no. 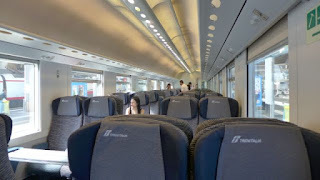 9 had faulty air conditioning so the Trenitalia staff told us we could find seats at other coaches. 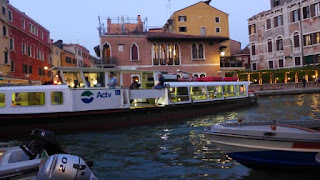 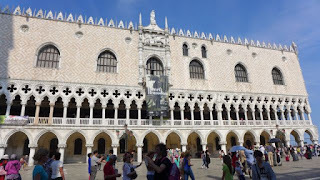 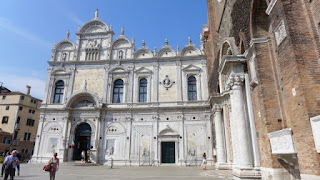 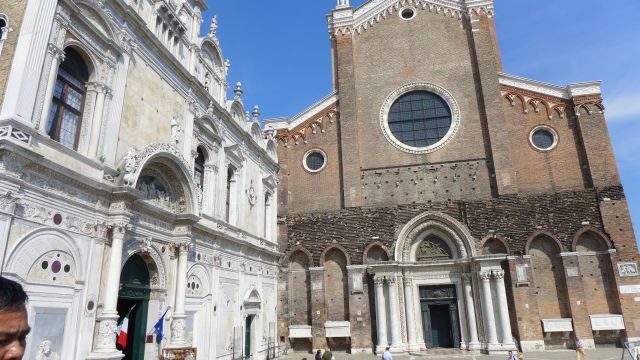 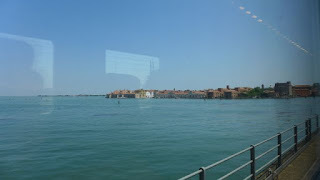 We moved to 2 coaches away (it was too stuffy to stay put ), luckily no one was seated there until we reached Venice. 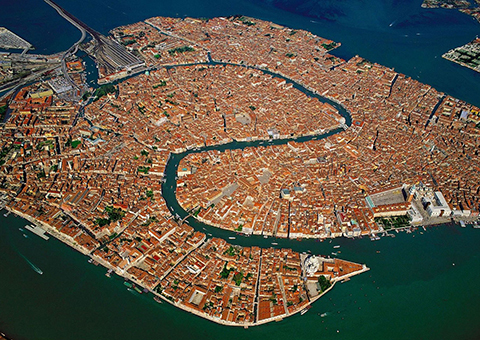 Venice, or Venezia in Italian, is built on an archipelago of 117 islands formed by 177 canals in a shallow lagoon, connected by 409 bridges. 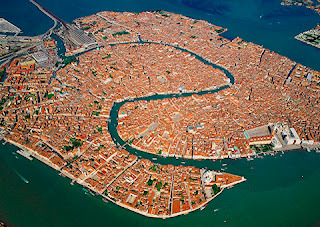 In short, it is an island! 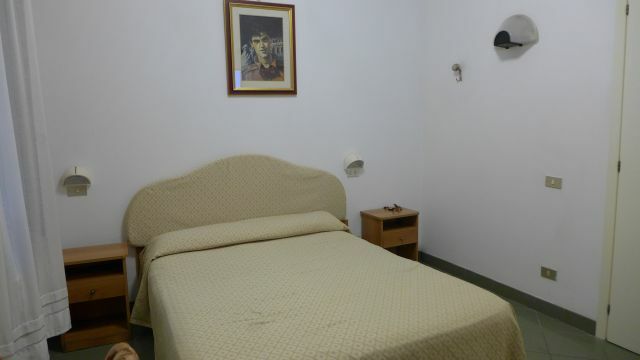 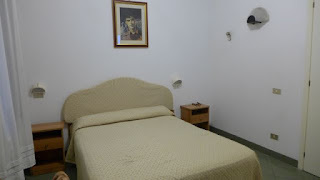 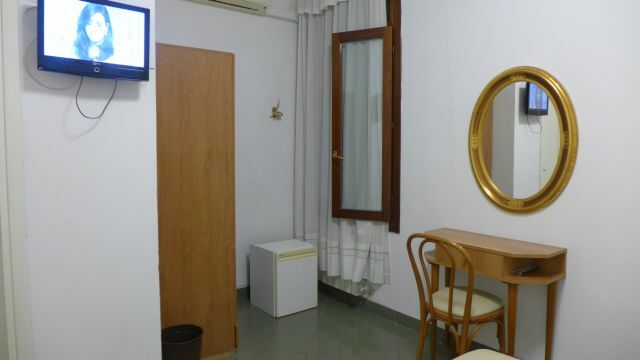 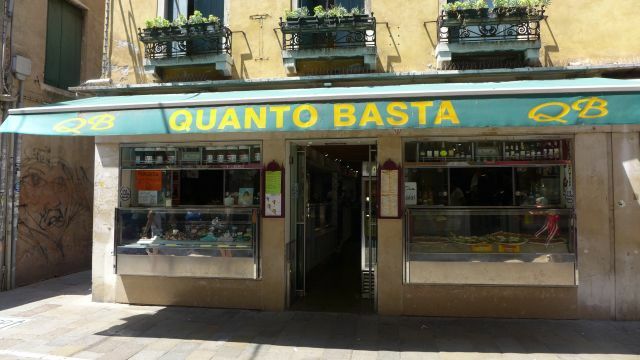 It is located in the marshy Venetian Lagoon between the mouths of the Po and the Piave Rivers. 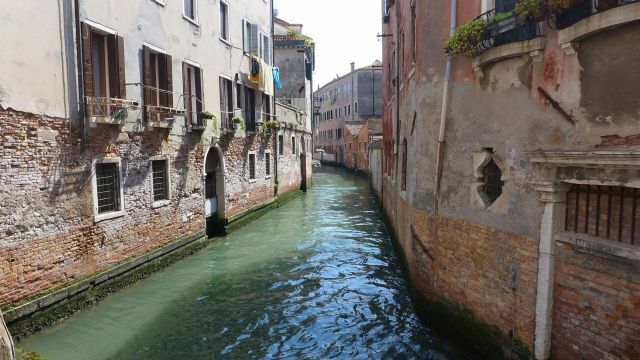 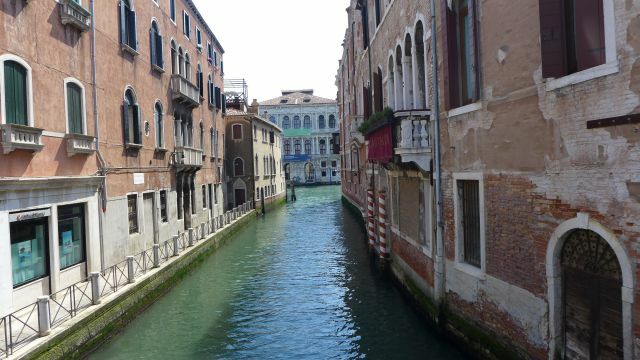 The canals serve the function of roads, and almost every form of transport is on water or on foot. 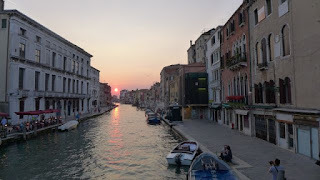 It is car free! 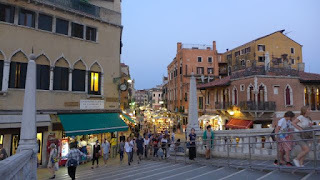 It is connected to the mainland by the Via della Liberta causeway. 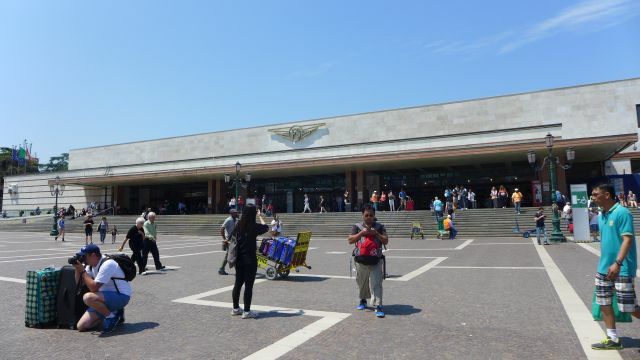 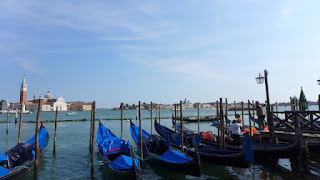 Cars can pass through the causeway but need to be parked at Piazza Roma, then you need to travel by foot or water transportation , the waterbus or vaporetti. 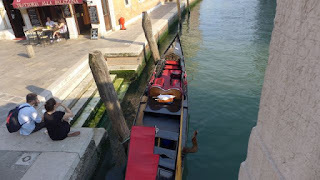 You can also take the traditional gondola, but this is mostly for pleasure rides. 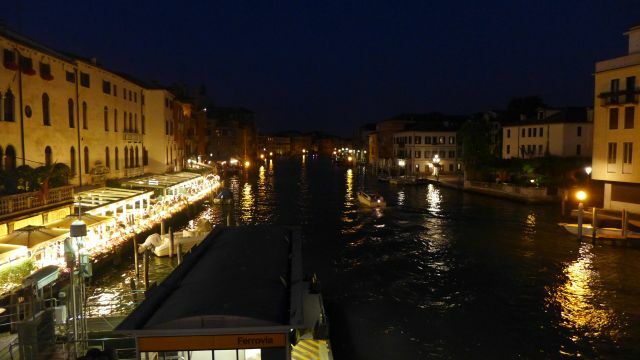 A 30 minute ride via the gondola cost EUR 80 during the day and EUR 100 at night (starting 7pm)! 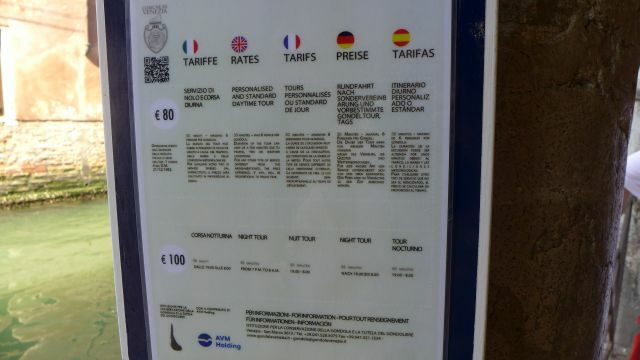 This is the standard official rate as shown on signposts across Venice. 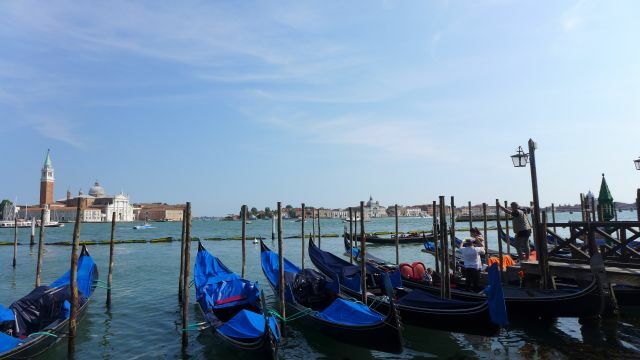 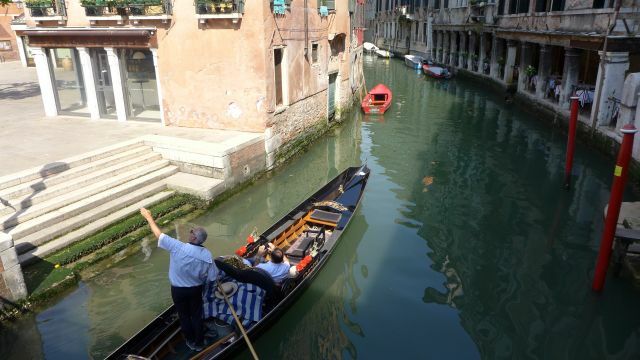 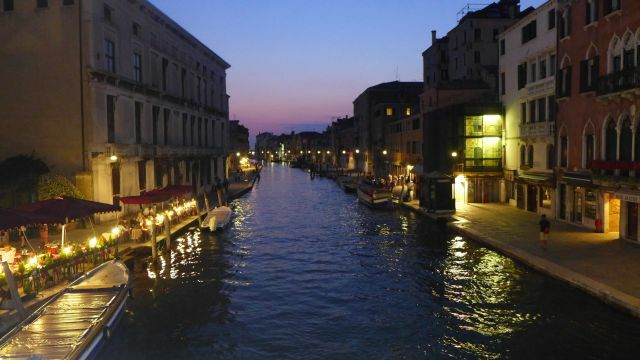 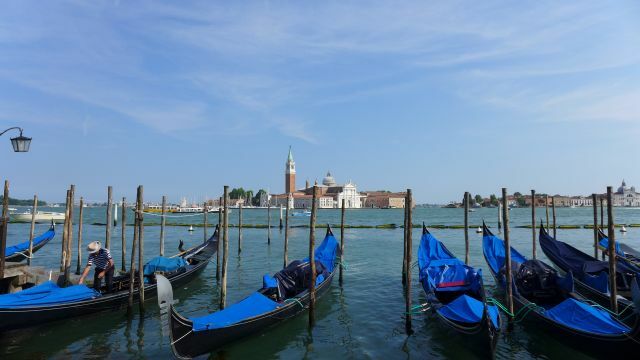 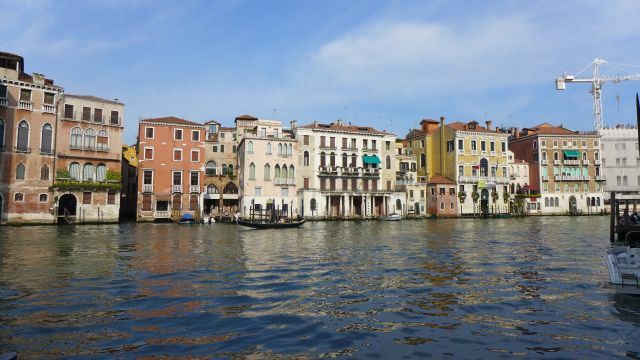 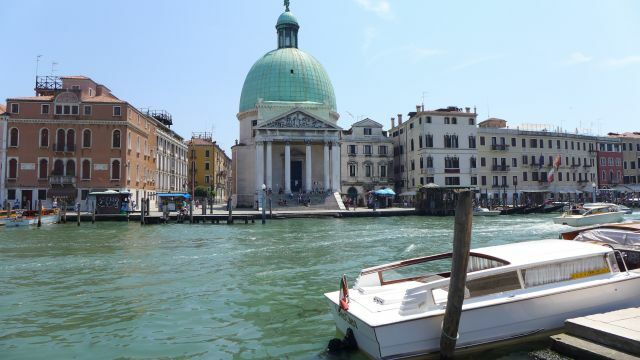 If you ask the gondola driver (or gondolier) to sing for you, you might be charged more! 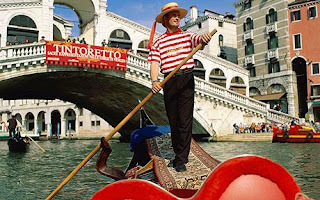 A gondolier can be recognized by his signature striped shirt and hat. 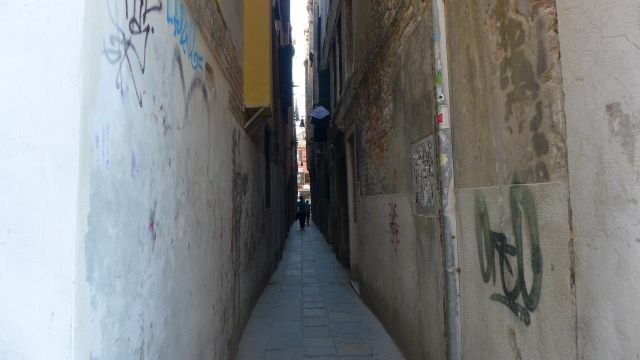 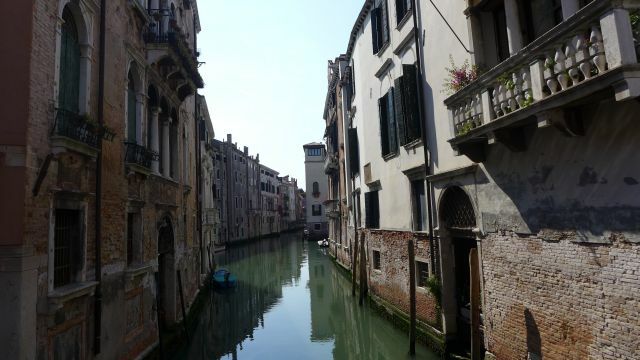 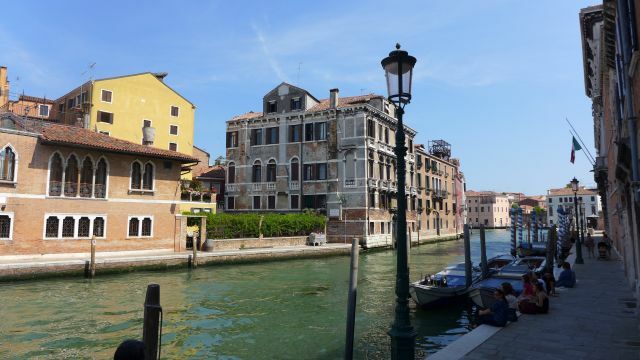 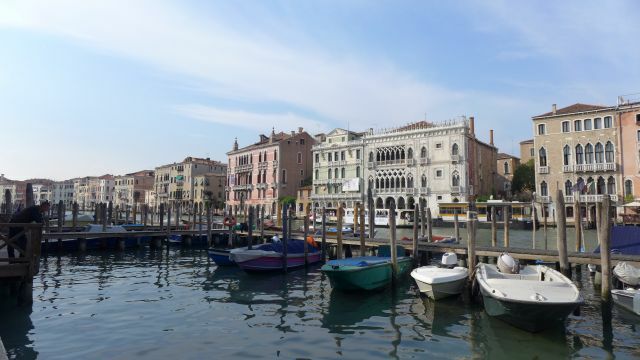 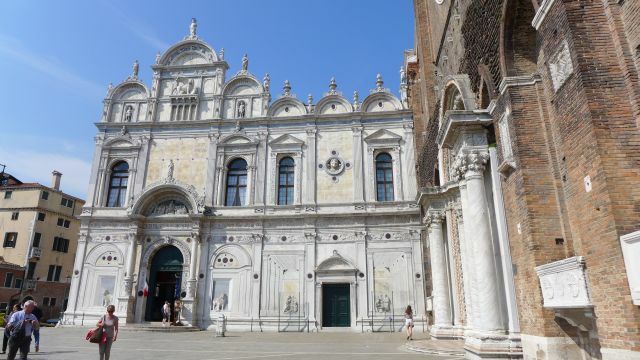 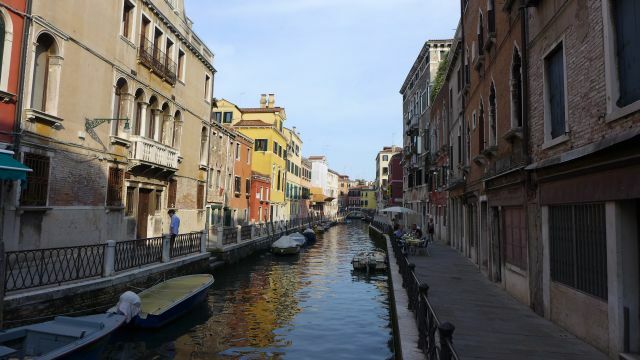 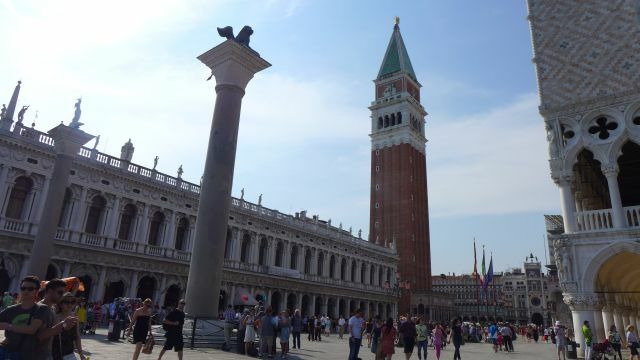 The buildings of Venice are constructed on closely spaced wooden piles. 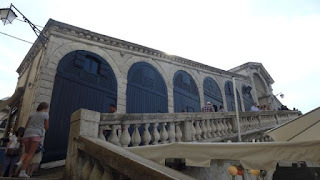 The foundations rest on plates of Istrian limestone placed on top of the piles, and buildings of brick or stone sit above these footings. 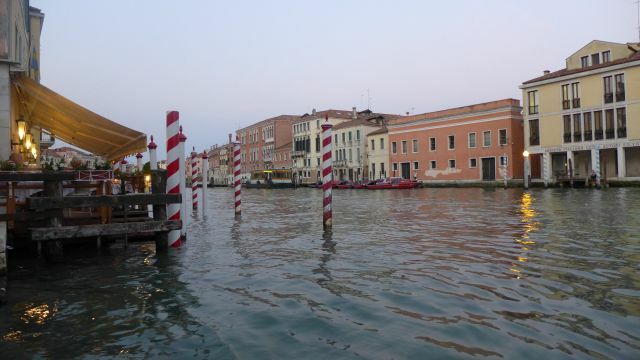 The piles penetrate a softer layer of sand and mud until they reach a much harder layer of compressed clay. 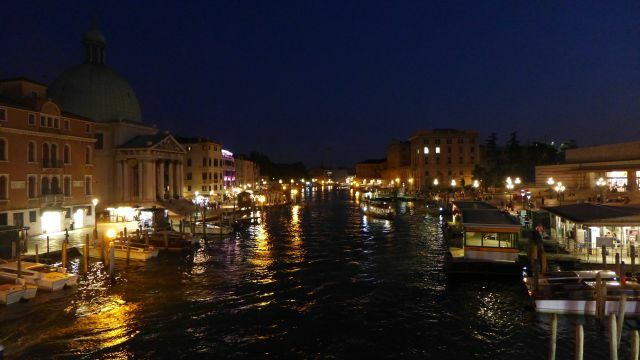 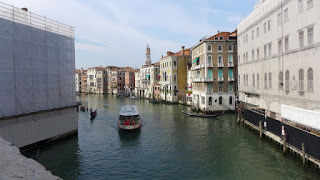 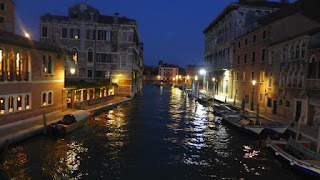 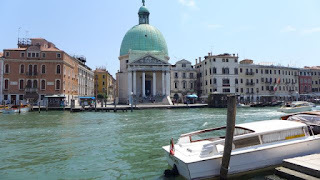 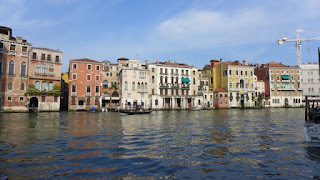 We arrived at Venice as per schedule and were mesmerized with the view of the Grand Canal coming out of the Venezia Santa Lucia train station. 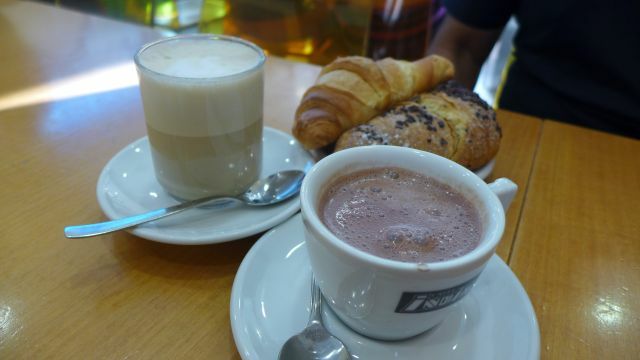 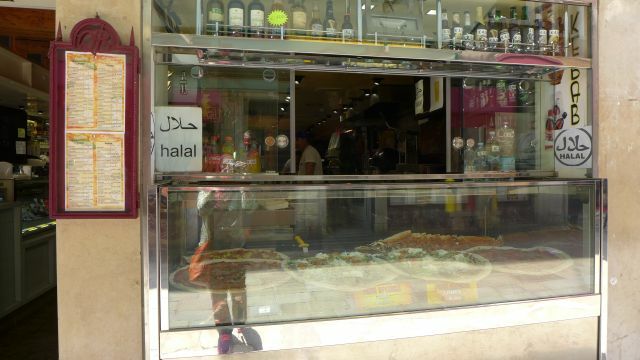 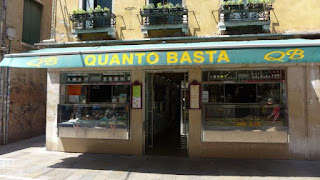 We stopped by at Quanto Basta, a halal eatery very near to the train station, and on the way to our Hotel Marte. 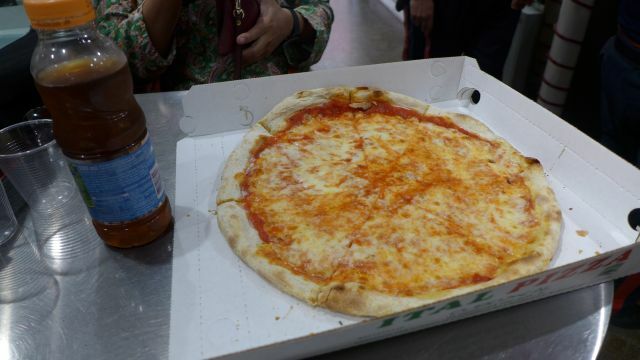 We ordered a regular size (the maxi size was too big!) Margherita pizza (tomato and mozarella cheese) for EUR 5.50. 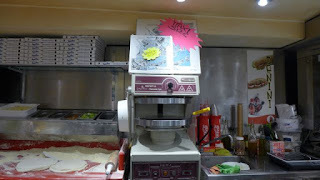 We could watch the pizza making live from our table. 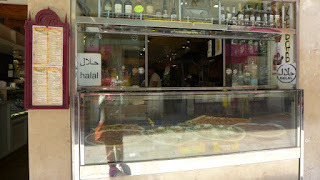 It tasted really good as we were also famished. 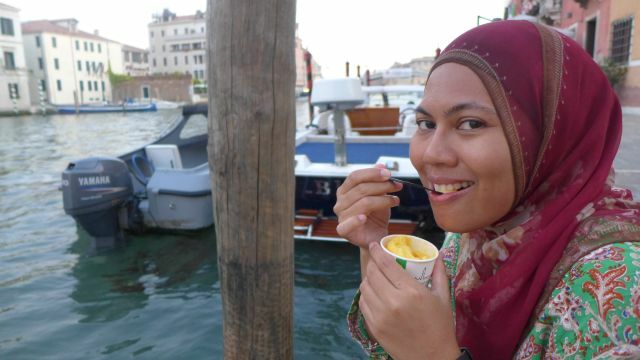 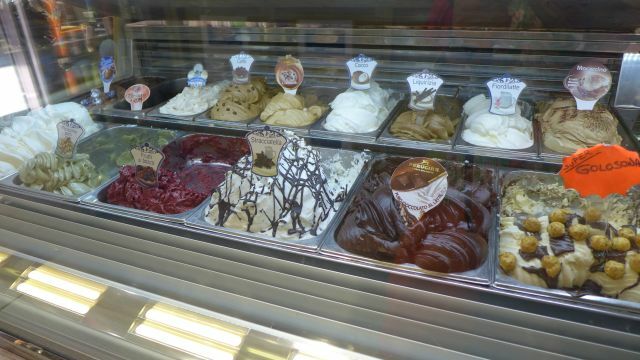 We then had the gelato (EUR 3.4 for 2 scoops) which came as a great delight under the scorching hot sun, it was the beginning of summer! We then continued to walk to our Hotel Marte, which was just 5 minutes away and refreshed ourselves a bit before venturing out again. 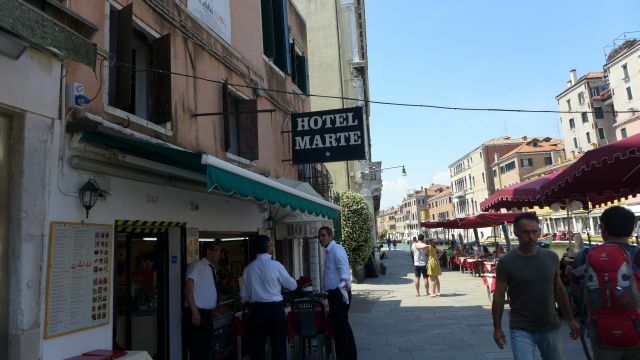 We had to climb up the stairs for check in, and thankfully our room was just next to the check in counter. 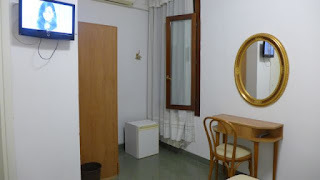 Our basic room cost EUR 100 for 1 night with free wifi and free breakfast of hot drink and croissant which we had at the cafe just below the hotel the next morning. We were greeted by a lady and her grandmother I assumed, who guessed our nationality correctly! Bravo senorita! 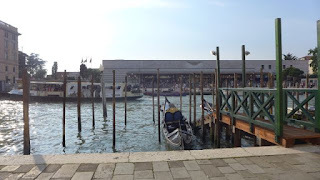 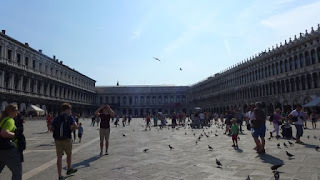 A bit of walk from the main Piazza to the connecting Piazetta San Marco lead us to the Molo or the quay at the Venice lagoon where gondolas are parked. 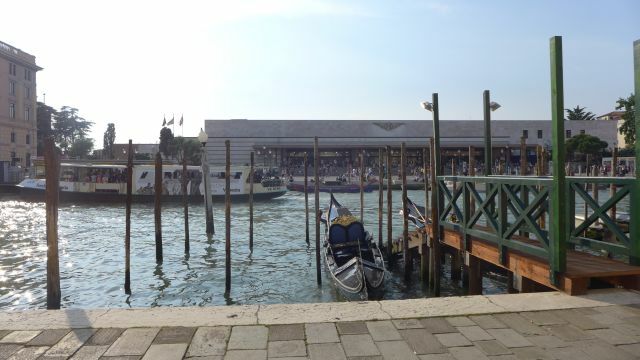 We sat by the quay for a while, taking in the view of the sea and the busy Piazza with all walks of people. 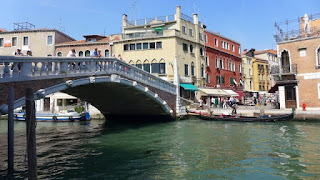 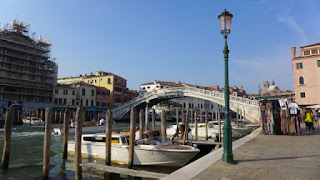 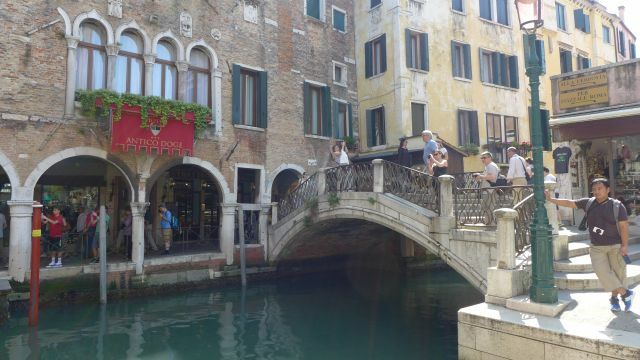 We then proceeded to walk to the Ponte di Rialto, one of the 4 bridges crossing the Grand Canal of Venice. 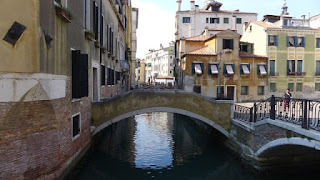 It is the oldest bridge crossing the Canal, built in 1811. 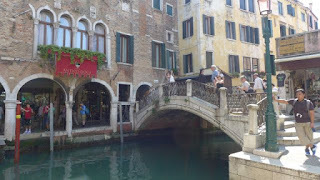 Unfortunately, it was under restoration during our visit, so we couldn't get a good picture of the bridge and there were many people too. 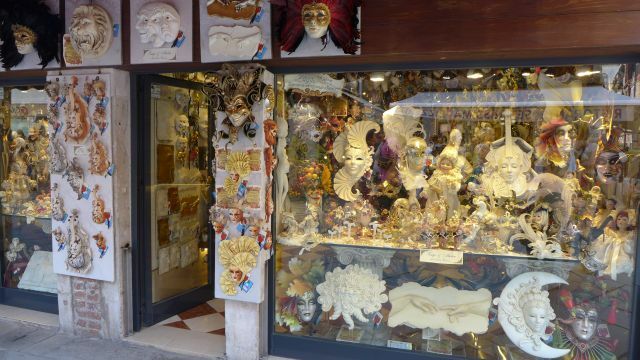 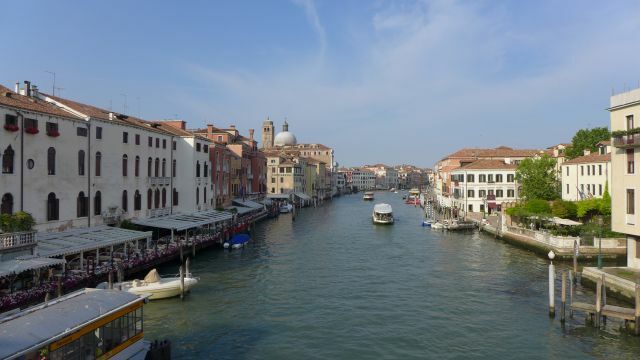 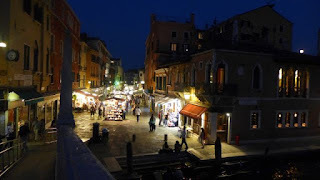 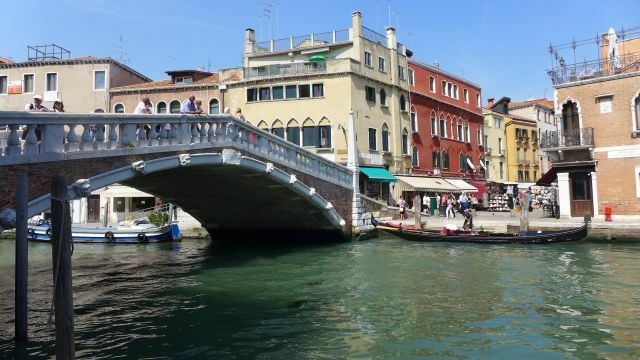 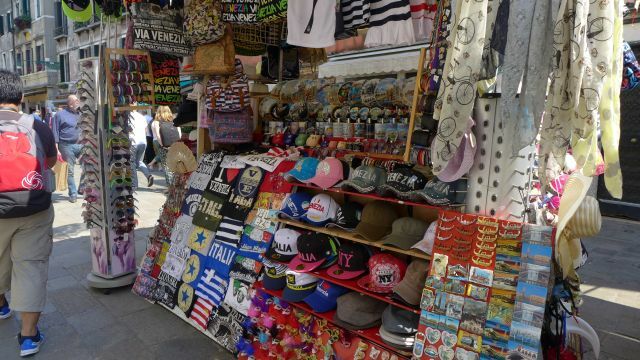 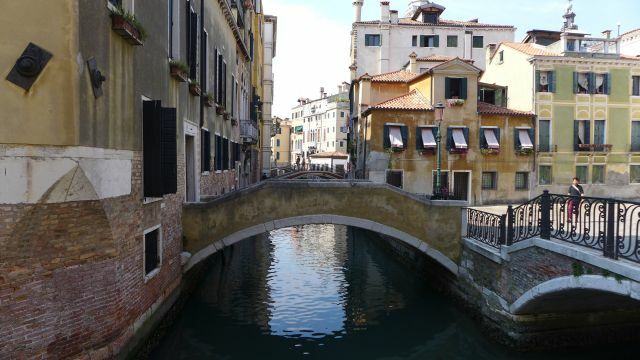 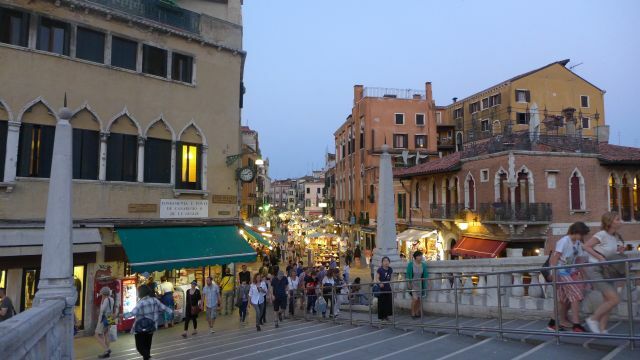 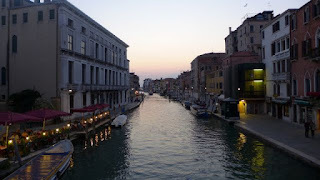 From the Rialto bridge, we walked towards the direction of the train station, effectively covering 3 of the 6 boroughs or sestieri of Venice: San Polo, San Marco and Cannaregio by walking. 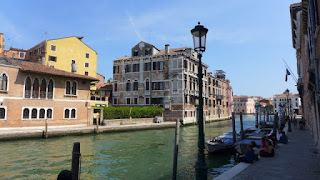 We crossed from San Polo to Cannaregio via the Ponte degli Scalzi bridge, crossing over the Grand Canal back to the train station. 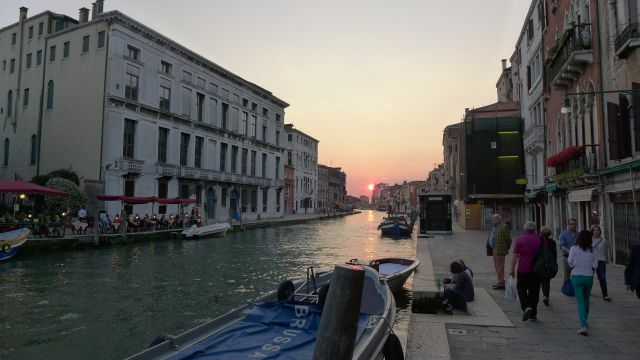 We hung around the ponte (bridge) in front of our Hotel Marte until nightfall and were rewarded with a stunning view of the Venice sunset from the bridge and some beautiful songs rendered by a live strings and guitar ensemble from a nearby restaurant. It was so beautiful that I recorded one of the songs. Ah good night Venice, tomorrow morning we would be leaving for Rome.